On The Rocks is a mountain top getaway nestled in the trees only 7 miles from downtown Blue Ridge. Relax by one of the two indoor remote control gas fireplaces, in the hot tub, and swinging or rocking on one of the two screened in porches. Enjoy the sunset on the open air deck with mountain view and a gas BBQ grill and hot tub. Play games or billiards with friends and enjoy movies or The Game on one of the 4 Satellite TVs. Relax and make s’mores with the kids by the outdoor fire pit. Perfect for either a romantic getaway or relaxing with family and friends. On The Rocks is a Non-smoking cabin that accepts pets and had paved road access. 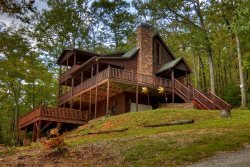 3 Story Luxury log home with 2 screened in porches and wrap around open porch on main level with hot tub. Sleeps 9 with three bedrooms, three full bathrooms and loft with twin beds and twin daybed in the terrace level bedroom. Great room has cathedral ceiling, gas fireplace and HD flat screen with Satellite TV with football channels during game season. Two screened-in covered porches with Amish swing, willow rockers and hammocks, and dining table. Wrap-around open deck with rockers, bar top table and chairs and a sunset view, outdoor private turbo-jet hot tub and BBQ grill. Child-proof gate on upper open deck to keep children safe area pets out of trouble. Each bedroom has a private porch or deck.